holders comprise around 10% of Australia’s labour force. supply of skilled labour in particular occupations. transformations in discrete segments of the skilled job market. 2015 and that indexation occur each financial year. under labour agreements and Designated Area Migration Agreements. 1 and 2 be removed. labour agreements and Designated Area Migration Agreements. the employment of four or more tradespersons). legitimate employers that abide by Australian workplace laws. horticulture sector and the meat processing industry. were charged exorbitant levels of rent by the labour hire contractor. franchising issues, etc. There are 33 Recommendations in total. the report out for yourself here. 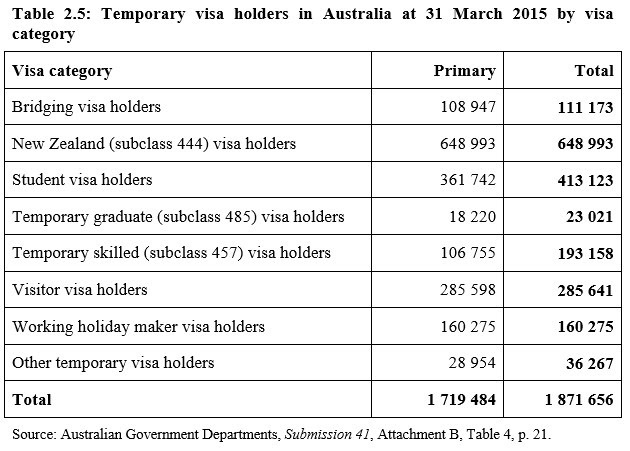 According to the report, there are over 1.8 million temporary visa holders in Australia (see Table 2.5 below), with approximately 1.4 million of them having work rights. Rather than worrying about the abuse of migrant workers, we should be more worried about the resident Australians who are being denied jobs because migrant workers are ready to undercut wages and working conditions. It's assumed then that they are "lazy", when many have just given up! Before the end of the White Australia policy, Pacific Islanders were being recruited from Melanesia, the Soloman Islands in particular, to work in the sugar plantations on the coast of Queensland. Kanaka, as they were known, were forced to live in a state of indentured servitude under extremely harsh conditions. In an attempt to control the growing death rate of the kanakas, the Queensland Government passed the Polynesian Labourers Act in 1868 and another Act in 1883 to control the number of kanakas being imported and the environment in which they were living. Many sugar cane farmers felt that the cheap labour of the Pacific Islanders was essential to the success of the industry. Victoria passed a law in 1855 to restrict the number of Chinese immigrants who could come through it's ports, but that only forced the Chinese to seek other ways of entering the country. New South Wales and South Australia passed similar laws in the late 1850's and early 1860's. In indentured servitude Chinese workers would usually sign a contract stating they would work for a certain period of time in exchange for their passage to Australia. This caused unrest among the citizens of Australia because the Chinese were willing to work for lower wages, work longer hours, and were more dedicated to their work than Australian. Now, the inclusion of clauses permitting the employment of temporary migrant workers in the China-Australia Free Trade Agreement has provoked heated debate. If ordinary Australians haven't woken up to this betrayal of the right for Australian work and Australian pay and conditions then the game is over for them and their kids. Why bother training an apprentice when you can bring in cheaper foreign labour on all these plus $150 million projects. Australian unemployed are being exploited by having their jobs lost to foreigners, something that the White Australia policy achieved.